I wanted to hop on the gradient glitter bandwagon started by Jennifer Rzasa. She made a beautiful blended glitter card that has inspired a lot of people. I couldn't bring myself to mix my glitters(!! ), so I used half inch scor tape to create a rainbow with my various microfine glitters (one at a time!). I then cut this ring using two circle nestabilities. And then I didn't know what to do with it! In the end I decided to go with a masculine valentine - simple, but with a pop of colour and sparkle. Not 100% sure of any perceived symbolism of a black heart. I'll be interested to hear what you think! Perfect for the Make It Monday - Glitter Embellishments and CASual Fridays Colour block challenges. How GORGEOUS!! You have used the glitter to its maximal effect! Totally love this! LOVE your glitter circle, Ardyth! Lovely clean work, Ardyth! Love you process of getting the glitter line straight! I used a black heart too, just seemed to fit the picture! This is so pretty. The black heart fits the card perfectly. Creating that circle and then not knowing what to do with it sounds like something I would do. LOL! You used it perfectly! The gradient glittered circle looks fabulous. Black, kraft and coloured glitter - fabulous combination! (I wouldn't be able to mix my glitters either!) Love the black heart - a colour wouldn't have worked the same. Ardyth, I think the black heart makes it great for a masculine card. Just awesome! Thanks for playing along with us at CAS-ual Fridays! I wouldn't be able to mix my glitters either (if I had multiple colors). Your card turned out beautiful and the black heart is just perfect. Wouldn't have thought anything about the black heart...I love it against all the glitter! That card was love at first sight! The black heart didn't bother me, can't imagine it in any other color! Do you have already plans for the center? I love your glitter circle, Ardyth! I think with the horizontal stripes, it takes on a great masculine feel, and I think the black heart is fabulous! We use black flowers, ribbons, buttons, etc., right? So, why not? Great interpretation of this technique! Thanks for the link, too! Really nice, clean, simple card -- but with lots of interest from the glitter. I love the black heart and never thought about the symbolism of it until you mentioned it! I love this-I must have missed all the action about mixing glitter--but love it anyway. And, the black heart--well, I think it is sweet and masculine. Love it! I like the black heart against the rainbow sparkle circle! I think the black heart is a nice contrast to the rainbow glitter. Jennifer McGuire creates black hearts all the time! Gorgeous! I don't use glitter much as I can never get it to stay put! It always seems to end up rubbing off of the card. Do you use anything to seal it? So striking! I could never mix my glitters either. Just like I couldn't separate my stamp sets, or cut my 12 x 12 papers. 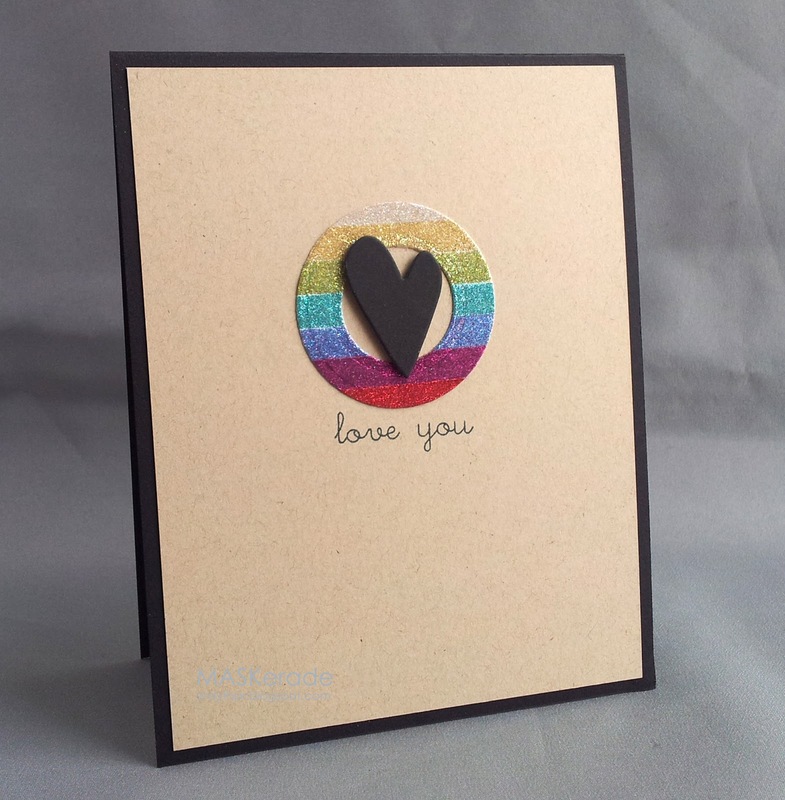 The black heart definitely keeps this a masculine card with all the sparkly glitter. Love it! Another simply stunning card! Love the colors you used.